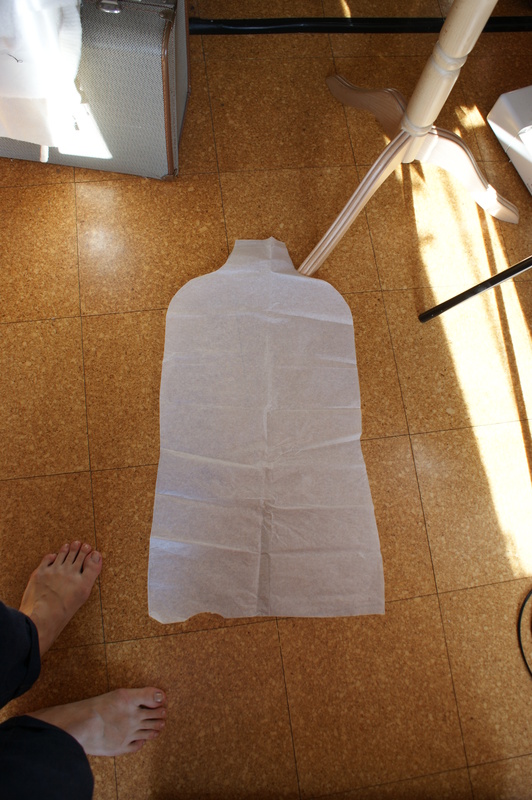 I promised some friends I would do a tutorial on padding a dress form to modify its measurements (and make it softer) , so here it is in all its glory! 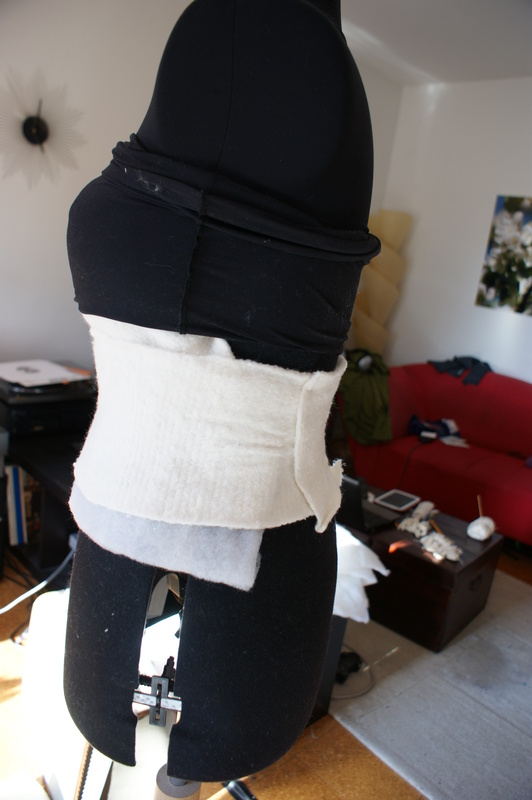 This is a style of padding that is adjustable, so changing the dress form to a client’s/friend’s measurements will be simpler. 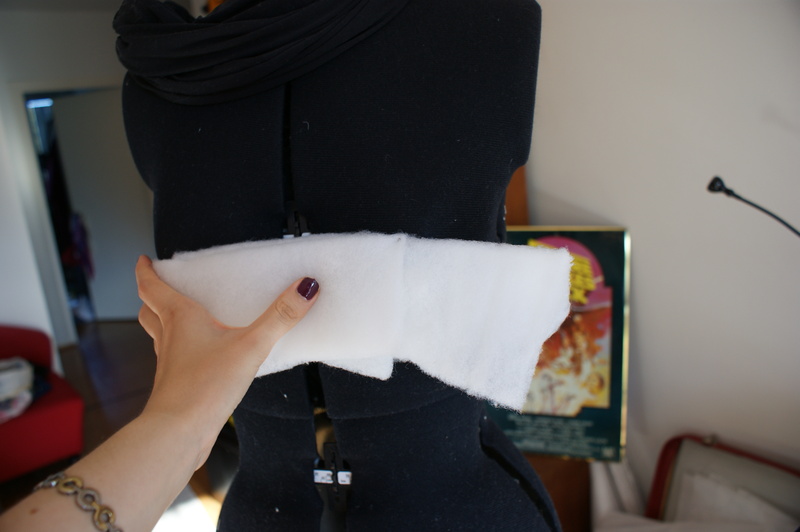 the first step is to make the lycra cover that will smooth out the wadding. I used a pattern I got from the seamstress I was interning for in the spring, but the pattern is not really very exact. 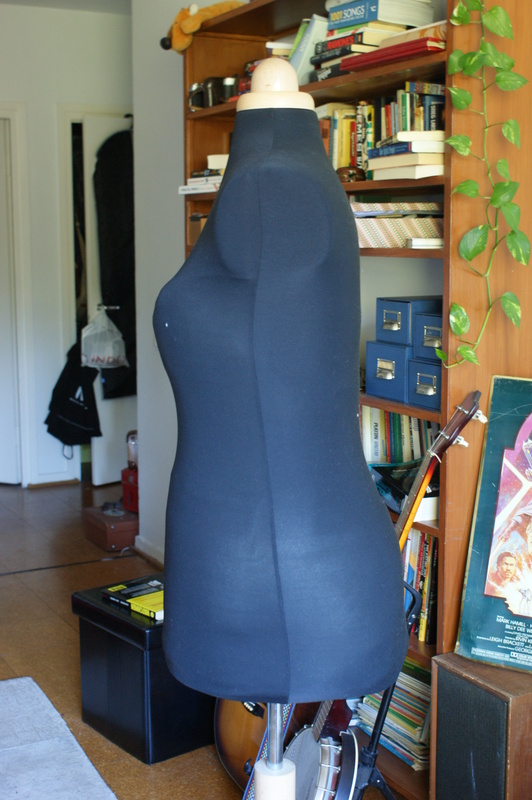 As long as you have sort of a torso form that is slightly tight on your dress form (easiest to do by sewing up and then fitting and adjusting on the doll) you should be fine. this is what my pattern looked like. 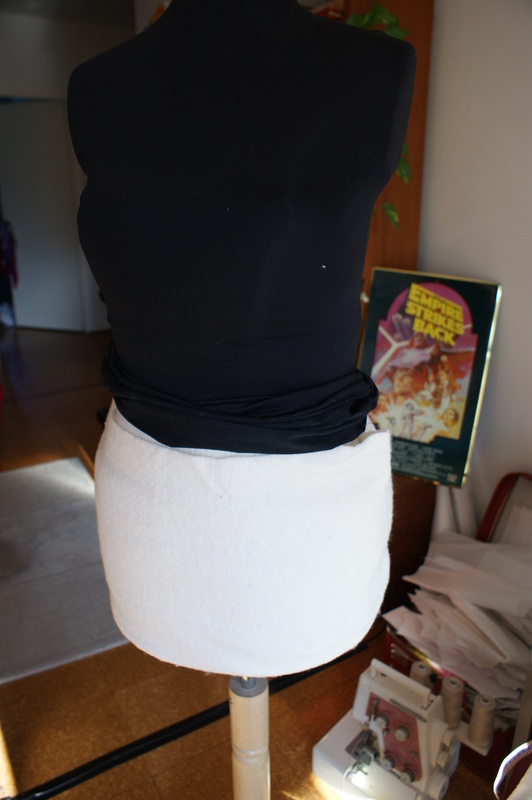 It could’ve been made a little tighter at the waist though, but that’s not such a big problem. 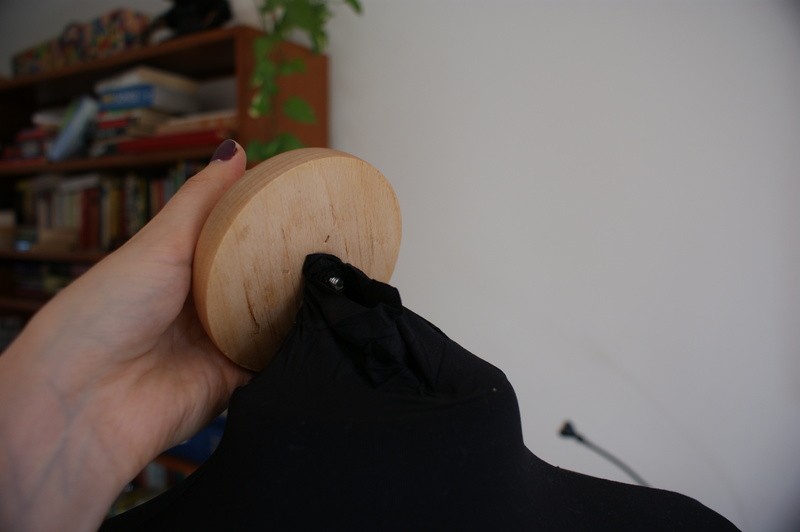 After you’ve finished your cover and are satisfied with the fit, pull it on your dress form, and if possible, secure at the top. I did this by stuffing the extra neck fabric under the removable top of the dress form, but I’m not sure everyone has that option. 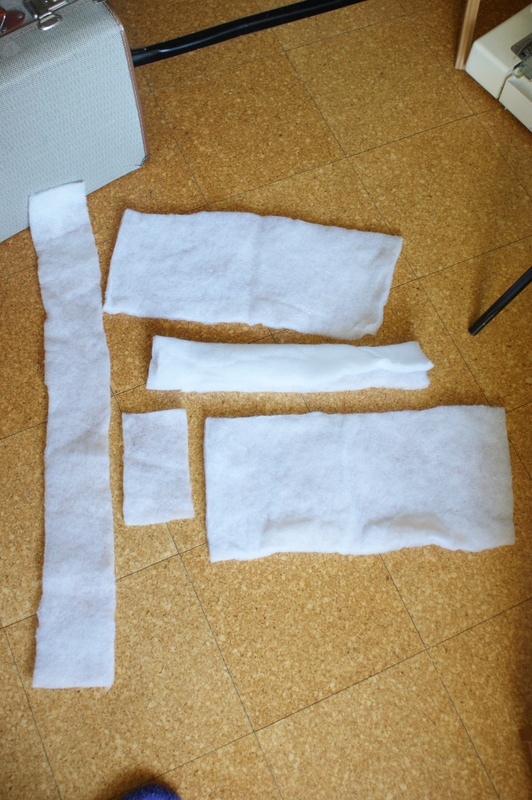 I like to have my wadding in strips of various sizes, but experimenting with the shapes could be interesting. Circles, ovals, and such would probably make the padding more exact. You can also fold or roll the strips. The cotton wadding I like in bigger pieces, since it’s mostly meant to smooth out the edges. Finally, the actual padding. Roll the lycra cover all the way to the top like so. If you’re using an adjustable dress form, like me, set it to the approximate shape that you want, but leave some room for the wadding. 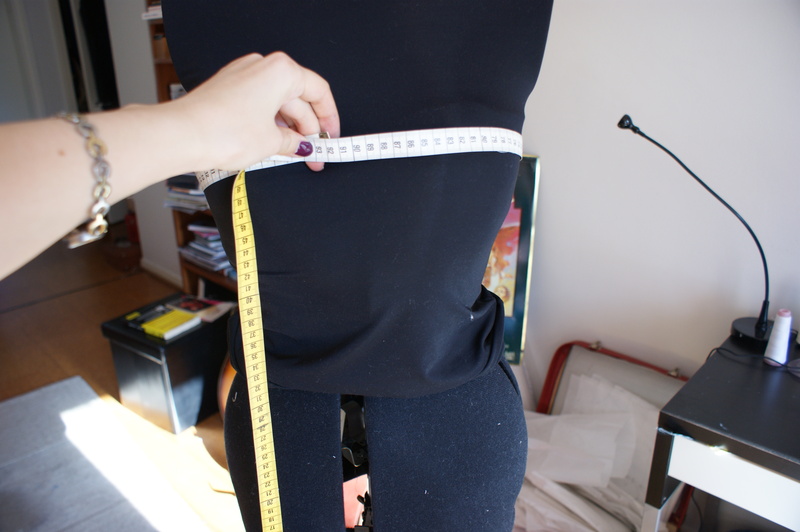 I usually leave the dress form measurements around 5-10 cm (2-4″) short of the finished measurements. If you’re using a solid one, you might need some more wadding, depending on the size you’re going for, and the original size of your dress form. 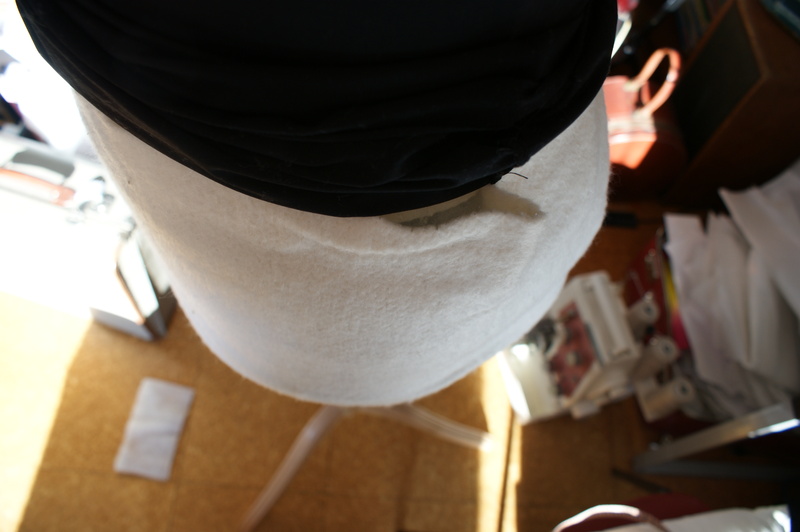 I like to begin the padding from the top, and then move downwards. 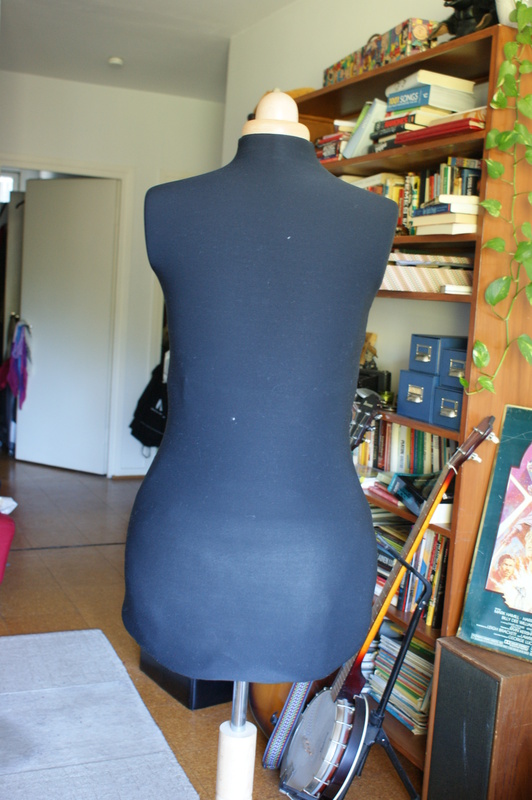 So start adding some wadding (heh) to the bust area (and/or back, if it is particularly curved at the top). You can use pins, but make sure that you push the sharp ends as far as you can, so they won’t prick you when you’re working on the dress form later. The perks of padding really come out with the bust area, I think, since here you can adjust one of the things that is always the same, even on an adjustable dress form — the apex, or bust point. 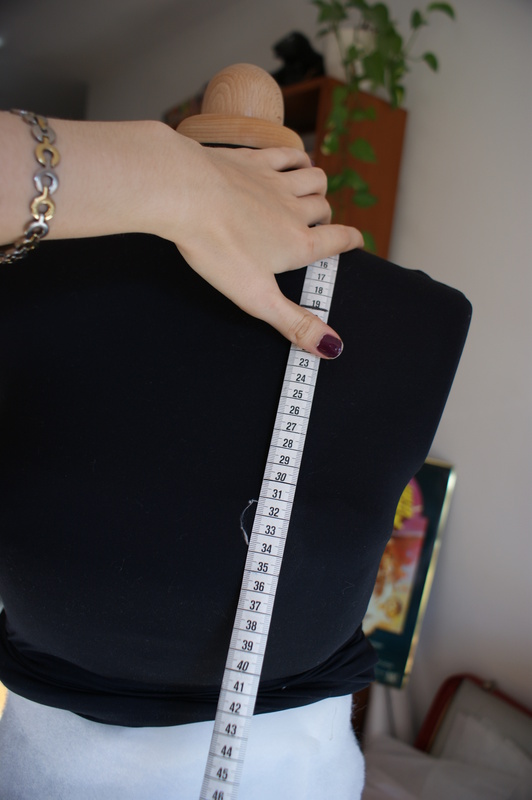 Most dress forms seem to have considerable perky breasts, and since the apex is one of the key points of a good fit, this is really something you’ll want to adjust to a more realistic measurement. I do this by adding the wadding (heh) mostly under the apex of the dress form. If you want a more outlined breast form, you can always attach a bra of the correct cup size to your dress form, and stuff that with wadding, but I’ve never found this necessary. 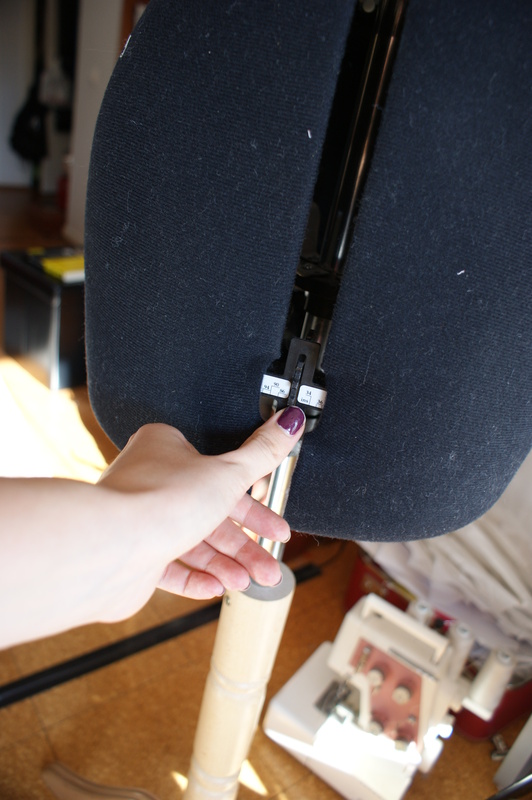 Measure only after you’ve pulled the cover on the area you’re working on (it may tighten the wadding a bit, thus making the measurement smaller than without the cover). 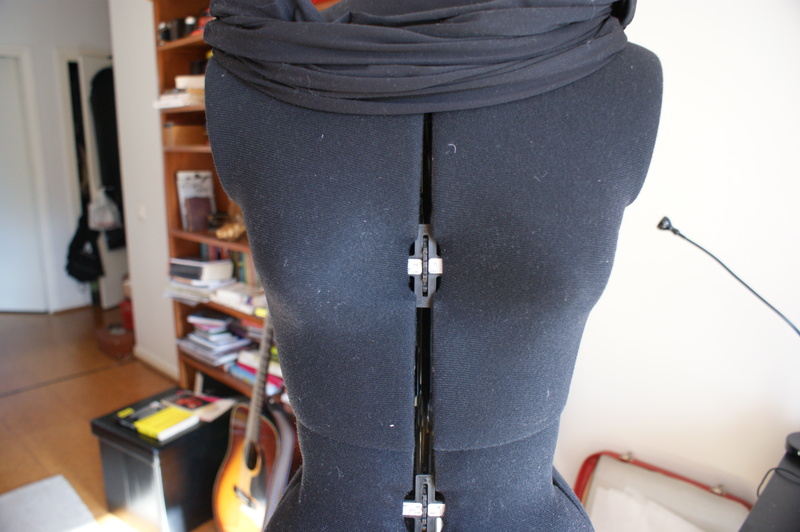 When you’re satisfied with the shape and measurements of the bust, move on to the waist. With the waist you should also keep in mind the shape of the body you’re imitating (big tummy/small tummy? Sway back?) and place the wadding in accordance with that. 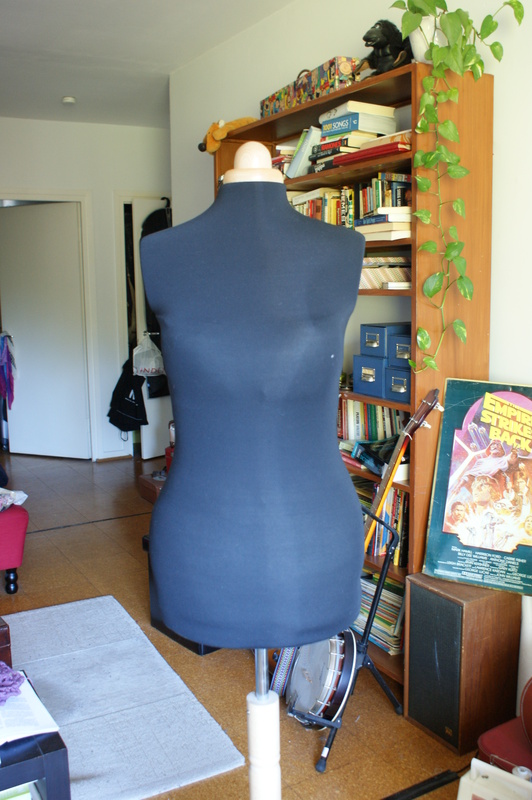 As you can see, there is polyester wadding only on the front, since this body (mine!) has a rather pronounced sway back. The cotton wadding goes all the way around just to smooth things out and keep everything in place. Next up is the hip area. 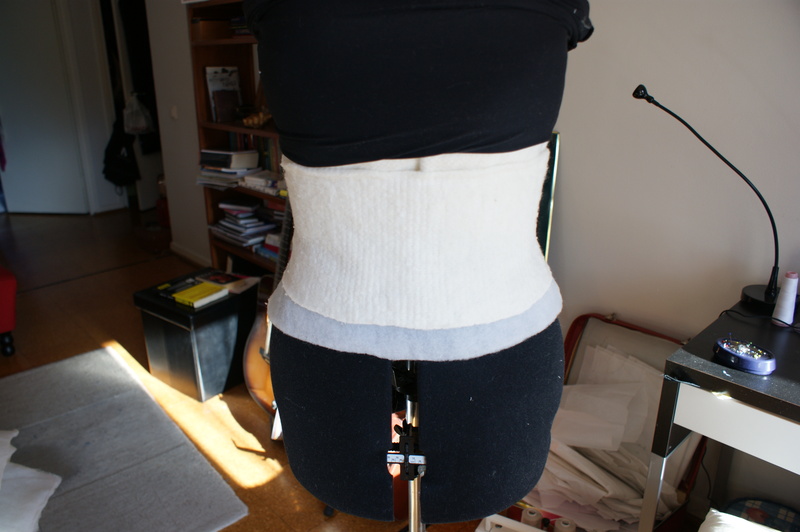 Same as with the waist, think about where you want the shape to be, and pad accordingly. 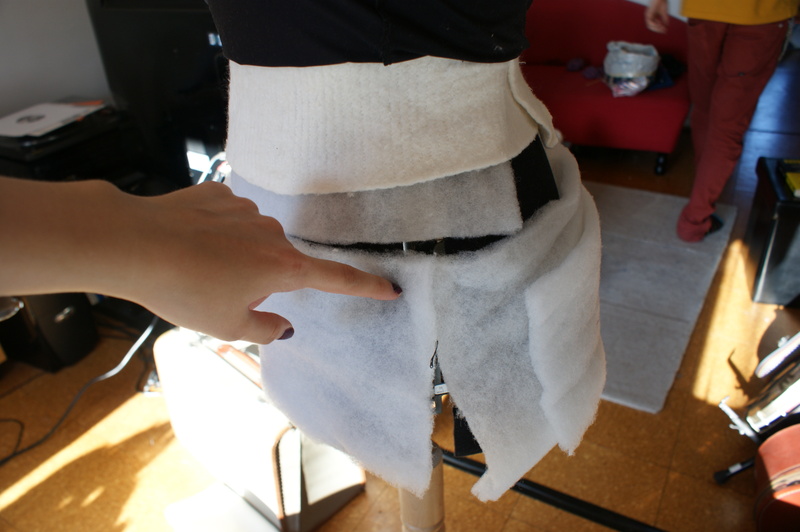 There might be some leftover fabric at the waist where a dart would desperately want to be, but you can just smooth that out towards the back and it should look fine. Now pull the cover over your wadding, smoothing everything out as best you can. Check all your measurements and the general shape, and you’re done!